Empower your Realm of spiritual well-being with the magic of Incense, Herbs, Powders, Crystals, Mystical Jewellery, Oils, Spells and much more. Bring All Your Dreams Alive! Welcome to The Realm Of White Magic - Empower Yourself! 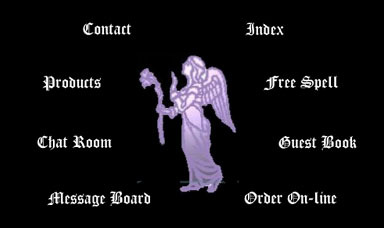 Here is a listing of what you will find on this site - Books of Shadows, Wands, Cauldrons, Bottles, Altar Tiles, Altar Cloth, Athames, Brooms, Besoms, Incense Sticks, Granular Incense, Self Igniting Incense, Mystical Oils, Magickal Spell Oils, Magickal Fragrant Oils, Papa Jo's Prayer Kits and Prayer Oils, Saints, Magickal Herbs, Gums, Resins, Roots, Powders, Rare Magickal Herbs, Curios, Folkloric items, Four Leaf Clovers, Fairy Cross, Steoralite, Cross Stone, Amethyst, Citrine, Quartz Crystals, Crystals in a Bottle, Oil Bottle Pendants, Glass Bottles, Bottles with Cork seal, Funnel for oils, Pippettes, Egyptian jewellery, Celtic jewellery, Animal magic jewellery, Gender/goddess jewellery, Bottle pendants, Bracelets and bangles, Jewellery boxes, Pentagram jewellery, Symbolic jewellery, Witchcraft videos, Witchcraft DVD Wish On A Spell, Deborah Gray Books, Magickal Books, Hematite Jewellery, Hematite Singing Power Stones, Parchment, Calf Vellum, Sheepskin and Goatskin Parchment, Magickal Ink, Quills, Nibs, Ink Pots and Stands, Spell Kits, Floor Sweep, Magickal Waters, Four Theives Vinegar, Florida Water, Crystals, Soaps, Nag Champa Incense, Nag Champa Oil, Statues of Gods and Goddess, Millenia Gaia Statue, Adam and Eve Root, Mojo Bags, Brass Incense Burners, Brass Candle Holders, Copper Candle Holders, Brass Hanging Incense Burners, Candle Snuffers, Natural Candles 9hr and 2hr, Spiral Dance Music, Voices of Gaia music, Books, Crystal Sunlights and Deluxe Sunlights.....offering you Personal Service, we send orders all over the world - let us help you find what you need. Thankyou for visiting!